They also agreed that this didn generic lipitor may 2012 t make any difference.. I am from the south, the real south, not the Catskills or New Jersey but from below the Mason-Dixon Line. I was born in Conway, South Carolina but due to my father’s occupation lived in many places across the south including Georgetown, South Carolina; Bastrop, Louisiana; Memphis, Tennessee and a few other places in between. This past October, I had the opportunity to move to Lake Placid, NY and work for the Adirondack Mountain Club at the Adirondak Loj. I was a little concerned about the winter ahead of me at the time but considered it a new adventure. How different could a northern winter be from “North” Carolina? It was a bit different, I soon found out. The south is a warm, humid place where winter temperatures are rarely below freezing and snow accumulation is a rare sight. Among all of the places that I have lived, I had only seen enough snow to build a life-size snowman once. I had always thought of winter as a time to drink hot chocolate, decorate my room with snowflakes, and as an excuse to wear fashionable boots, scarves, and mittens. I suspected that living up north would change my vision of the season but was unable to grasp the reality of a northern winter. Until this year, I had never experienced lasting snow, ice, or extremely cold temperatures. I had never driven in snow, used a snow brush or had the need to wear so many layers. I learned so much this winter and was able to experience so many wonderful new things! One of my more dramatic stories from this winter was when I found myself at 3am, curled up in my car, stuck in the middle of Adirondack Loj Road. I was on my way back from the Albany airport in one of the biggest snow storms of the season. I was terrified. I had managed to avoid driving in the snow until that night. I convinced myself that I had to get to work the next morning, and that if other people were driving in the snow, so could I. Very slowly and very anxiously, I made my way from the Albany airport to Adirondack Loj Road. The snow on Loj Road was significantly deeper than that which I had been previously been traveling in. A mile down the road, the tire tracks I had been following turned into a driveway. I had a bad feeling about continuing but after making it so far already I was feeling pretty confident in my newly acquired winter driving skills. I put my foot on the gas pedal and went onward…for about six more feet. My car just stopped. It would not back up, it would not go forward. I tried not to panic and began weighing my options. Luckily I had followed the advice of a coworker and stashed a sleeping bag, snow shovel, snow brush, and snow scraper in the trunk of my car. I figured that I could do one of three things: walk home, shovel paths for each of my tires to drive in, or sit and wait for help to arrive. I decided to grab my supplies from the trunk as I contemplated. However, when I stepped out of my car all options involving walking vanished from my mind. I was wearing heeled leather ankle boots. The thin leather of these boots was no match for the cold, and the snow instantly invaded the ankles. I quickly grabbed my sleeping bag and waited for help to arrive. A couple of hours later I was able to hitch a ride with the snow plow, and had to watch in embarrassment the next day as my coworkers dug my car out of a mountain of snow. What an introduction to winter! I learned a lot that night, like the importance of being prepared for emergency situations. I am happy that I kept my sleeping bag and snow tools in my car, but have since added snow boots and snacks to the list. One of the major things I had to adapt to this winter were the cold temperatures. I had never truly understood that -2 degrees is a real temperature. Not only that, but that was the high on January 23 this year. And if that wasn’t cold enough, another night it got down to -31 degrees! I was not used to this, and the first time that my face went numb was a life changing experience. It happened on the summit of Cascade, when suddenly I became acutely aware that I could not feel my eyebrows. I then tried to talk and could not feel the words come out of my mouth. It was terrifying! In turn I have learned several ways to stay warm, one being how important it is to have a good winter wardrobe. Icebreaker wool, or any wool, is a miracle. I hadn’t realized that “cotton kills” until a staff table discussion one day at work when someone told me that cotton isn’t a good choice in the winter. Aside from practical, wool is also super cozy! I have also come to love regularly wearing hats, scarves, puffy coats, snow boots, gloves, mittens, and sometimes even gloves and mittens at the same time. Other tips that I have been given include eating healthy fats and keep moving. I found that the faster I move, the better. I spent weeks in February running from door to door as if trying to race my nervous system’s signals to my brain that “its cold!” Unfortunately that isn’t working so well now that the snow is melting and re-freezing, covering the ground in slippery ice! I also learned this winter that my outdoor activities would need some adjusting. Before I made the move to the Adirondacks, my parents took me shopping at Eastern Mountain Sports to pick out some winter hiking boots and snowshoes. I remember stepping on the store’s scale that indicates what size snowshoe you need and watching as my father instantly picked out the next size up, warning me that I would need the extra floatation to walk to work one day. While I haven’t needed my snowshoes for my morning commute, I have definitely put them to good use on the trails. 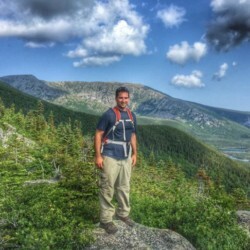 Other gear that has enabled me to continue hiking includes insulated hiking boots, microspikes, gaiters, waterproof clothing, and some very impressive socks. I learned a couple of tricks to make winter activities more enjoyable. My favorite is to put socks around my water bottles and store them upside down to prevent the water from freezing. I learned this the hard way one January hike out to Avalanche Lake. I walked for at least 10 minutes holding my tongue up against the ice seal trying to melt a hole in it. I hope no one was watching. (This also taught me to bring a lighter on hikes). In addition to adjusting to the cold, I have also taken advantage of the opportunity to try several new activities. My favorite has been cross country skiing. Before moving here, I never even knew that it existed. I have thoroughly enjoyed learning about the different types of skis and snowsports, and cannot wait to try them all! Above all, I have learned that winter is magical. There is no other time that you can walk out onto a lake as if it were land, and there is nothing like being surrounded by glittering snow. I hope to never forget the drama in the shadows of the trees cast over the snow by the afternoon sun or the brilliance of the blue sky against the white treetops. I will also never forget the first time I heard the snow fall off of the roof, a tree pop on an extremely cold night, or the ice in the lake shift! I feel so lucky to have been able to experience a winter at the Adirondak Loj, and am proud to say that in the past four months I have gone from awkwardly hovering around every heater vent to sleeping outside in a lean-to for a night. I have not gotten my car stuck on any more snowy roads, and have tried to take advantage of every special opportunity that winter has given me. 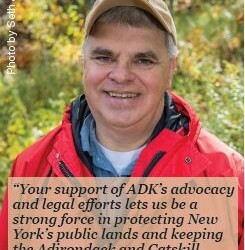 I am so grateful to my family for all of their support, and my wonderful coworkers at the ADK who have been so willing to help me, and take me on unforgettable adventures. My northern winter experience was not only educational, but unforgettably amazing. While I am excited to feel more at home with the warm weather, I am sad to see winter wane. I look forward to its return and the opportunity to solve some winter mysteries that still remain. For example, how do people ski uphill? Kayci Carlson is part of Adirondack Mountain Club’s Loj Crew and has recently been serving as Sous Chef at the Adirondak Loj. She has a B.A. in Psychology from Coastal Carolina University. Kayci also enjoys a variety of outdoor activities that include walking on the beach, hiking, kayaking and photography.